Joint pain seems to be the common pain faced by adults who are 50 years and above. People use supplements for joint pain while others resort to home remedies. Before you start to take remedies for your joint pain, it is advisable to consult a health professional. This is because you need to get the exact cause of your joint pain through a complete diagnosis, lab investigation and sometimes through the use of x-rays. There are many causes for joint pain: arthritis which is the most common is the inflammation of one or more joints. There are two kinds of arthritis, osteo-arthritis (wearing down of cartilage between bones at a joint until there is friction between bone surfaces) and rheumatoid arthritis (which is an autoimmune disorder causing inflammation of the synovial membrane, a tissue that protects our joints). Other causes of joint pain include: gout, bursitis, strain (tendinitis) or sprain. Joint pain can occur in any joint of the body but the most common is the knee. The pain can be mild or severe but remember regenerative conditions like arthritis needs to be diagnosed and treated properly. 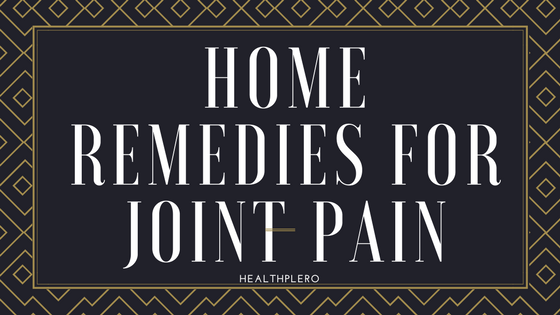 Here are some home remedies for joint pain. Garlic contains sulphur and selenium. This compounds have shown to relieve joint pain due to arthritis. Sulphur helps to relieve joint pain by reducing inflammation and selenium has an anti-rheumatoid effect. Massage helps to relieve pain by improving blood circulation. Use warm oil like olive, castor oil and massage the area over the joint. This is the process of applying heat on the skin above the painful joint. Applying heat helps improve circulation to the joint, relieves the pain in the muscles and joints. Do not apply heat directly to the joint. · Use a hot compress. Soak a face towel in hot water and apply over the joint for about 2 minutes. You can do this for about 10 minutes till you feel better. Caution: do not use heat therapy if the skin above the joint is inflamed as well; if it is red, swollen, painful or warm to touch. Calculate your body mass index (BMI) to determine if you suffer from overweight or obesity. If you are then you will need to shed some extra pounds. There exist weight loss supplements that have been proven to aid in weight loss. If you have a busy schedule, weight loss supplements like Garcinia Cambogia Plus and Raspberry Ketone Plus can help you achieve your desired weight. Numerous studies have associated these weight loss supplements with weight loss. Exercise does not only help you to lose weight but it helps improve circulation and maintains flexibility around your joints (4). It is not advisable to engage in difficult weight bearing exercises like running. If you love swimming then go in for it. Also go in for low impact exercises that do not involve stressing the joints like abdominal exercises, sit ups, leg lifts and so on. But consult your doctor or nurse to ensure you are on the right tract. Turmeric is a yellow spice common in indian dishes. There are numerous health benefits and uses of Turmeric, making it one of the most sought after ingredient in the world. If you can’t come across turmeric try looking for turmeric powder in the supermarket. Turmeric contains a chemical called curcumin that has anti-inflammatory properties and it may reduce arthritis pain. · You may take half teaspoon of turmeric powder and mix in a glass of water or milk and take it for about three days. · You may also consult with your health care provider so you can be prescribed turmeric capsules. It is important to note that the consumption of turmeric may interfere with certain medications such as blood thinners so consult a health care provider before consuming turmeric seeds. Taking Turmeric supplements is also a great way to meet your daily requirements of Turmeric needed to relieve joint pain. Ginger contains anti-inflammatory properties. This therefore means that it can help relieve muscle and joint pain. · Include ginger as a spice in your meals or add it to tea. If you come across fenugreek seeds it can be very helpful in relieving joint pain due to arthritis. This is because it contains anti-oxidant and anti-inflammatory properties. Mix a teaspoon of ground fenugreek seeds and mix in a glass of warm water and drink. Do this daily for about three days. You may also choose to soak the fenugreek seeds in water for about 12 hours and eat it. We need magnesium in our body. However our body cannot manufacture magnesium. Magnesium aids in in relieving stiffness and reduces pain. People who take magnesium or its supplements have higher bone density and stronger bones. Always eat foods that are rich in magnesium such as dark leafy green vegetables, nuts and legumes. Calcium has a calming effect in our body. It acts as a tranquilizer. This means that calcium has a calming effect on our muscles and therefore helps to reduce chronic pain especially those associated with injuries.